Aashada Shuddha Ekadasi i.e the 11th day after Amavasya (the day of moonless night) in the Hindu month of Aashadam is celebrated as Tholi Ekadasi. The Telugu word 'tholi' means foremost. Tholi Ekadasi is also known by the names 'Sayana Ekadasi', 'Aashadi Ekadasi', 'Devasayana Ekadasi', 'Padma Ekadasi' and 'Vishnu Sayani Ekadasi'. From this day, the Chaturmasya Vratam i.e the continuous 4-months vratam, begins. As per the religious beliefs, Lord Vishnu goes on deep sleep i.e Yoganidra on His Divine Serpent named Aadi Seshu, from the next day after Tholi Ekadasi. Hence the names 'Sayana' (bed), 'Devasayana' (Divine Bed) etc is prefixed to Ekadasi. Ekadasi day is highly auspicious for Vaishnavites i.e the followers of Lord Vishnu. Staunch devotees observe fasting the whole day, some even observe 'Nirjal Upavas' i.e fasting without taking any liquid / water. They break the fasting when it is Dwadasi. It is believed that those who perform 'Ekadasi vratam' will have 'moksha' (salvation) i.e redemption from the cycles of birth and death. As this is the first Ekadasi in the four continuous months of Chaturmasyam, it is known as and observed as Tholi (first) Ekadasi by the Telugu speaking people of the twin states of Andhra Pradesh and Telangana. It is also known as 'Prathama Ekadasi' in some regions of the country. According to a different version, in the ancient times Aashada Suddha Ekadasi was considered as New Year's day. Hence the word 'tholi' is prefixed to this Ekadasi. And according to Vedic astrology, it is from this day the Southward journey (dakshinayanam) of Sun begins. As it is the first Ekadasi in Dakshinayanam, it got the name 'Tholi Ekadasi'. According to legends, King Mandhata of Surya Dynasty was a noble and honest soul. He used to observe Ekadasi fasting with much devotion, particularly on 'Sayana Ekadasi' day. But unfortunately, during a certain period his kingdom had severe drought and many of his subjects and animals starved to death. To get rid of the situation and for the welfare of his people, the king observed Sayana Ekadasi fasting with much devotion, worshiped Lord Vishnu and thus got rid of the drought situation in his kingdom. According to another story, in the Krita Yuga (the foremost yuga), Murasura (a rakshasa i.e demon) did hard penance and was blessed by Lord Brahma (one of the Holy Trinity). As always, the power-packed demon started his atrocities on all including Devatas (the gods). When the gods sought Sri Maha Vishnu for help, He fought with the demon for nearly 100 years and was fully exhausted. 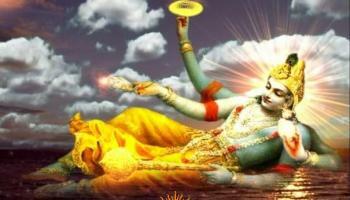 Lord Vishnu went to take rest in a cave, when a lady emerged from His body. She fiercely fought with Murasura and thus killed him. Lord Vishnu was pleased with the lady and asked her to ask for boon. The lady prostrated before Lord Vishnu, asked Him to bless her with the name Ekadasi and to let her remain dear to Sri Maha Vishnu. Thus, the first 'ekadasi' i.e 'Tholi Ekadasi' was formed on this day.